UFC President Dana White on the fallout from the NFL national anthem protests. 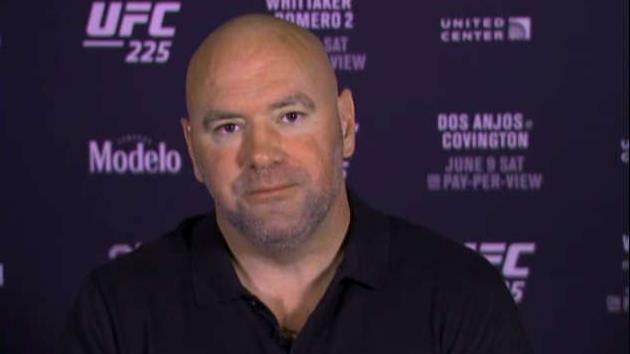 Longtime Ultimate Fighting Championship President Dana White said he has reached terms on a seven-year contract extension to remain at the helm of the mixed martial arts organization. "Ari Emanuel and I just signed a new seven-year deal, too," White said during an interview posted on UFC’s YouTube. "So we&apos;re here for seven years. ESPN is here for seven years, and the incredible things that we&apos;re going to work on, I just can&apos;t even tell you how pumped I am for all this stuff." Emanuel is co-CEO of William Morris Endeavor, the entertainment and media agency that purchased a majority stake in UFC for $4 billion in 2016. White did not disclose the deal’s financial terms. UFC confirmed the agreement but declined further comment. White has served as UFC’s top executive since 2001, overseeing its growth from niche attraction to mainstream sports property. He reportedly earned $360 million from his stake in UFC when the company sold. The UFC named ESPN as its television partner in a five-year deal worth $1.5 billion in 2018. At the time, White said UFC had a valuation of $7 billion.